Redbrush knows it’s helpful to hear from others who have come before. We’ve invited first-time author/publisher Randy Hawthorne to answer some questions that those considering a book project always have at the ready. Redbrush: Welcome, Randy. What is your book about and when did you start work on it? Randy Hawthorne: Thanks! …. 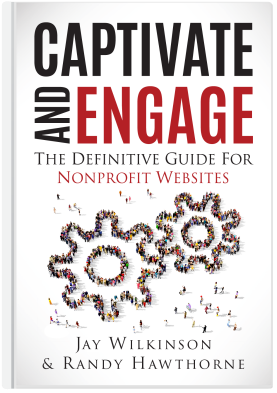 My book, Captivate and Engage: The Definitive Guide for Nonprofit Websites (Nonprofit Hub Press), contains the basics all nonprofit organizations need to know as they consider building a website for their organization. We started this project several years ago. Redbrush: What kept you from moving forward? Randy: My schedule and and that of my co-author, Jay Wilkinson, is always busy. And our subject matter was kind of a moving target. It was a challenge to decide when to take the snapshot of the industry when the technology is constantly changing. “Busy” plus an evolving field made it tough. Redbrush: What’s “busy” look like? Randy: Last year, “busy” meant weekly webinars and 10 speaking engagements for me. Jay did 92 webinars, and had 74 travel days, and 36 speaking engagements. Redbrush: What was the solution for you? Randy: After spinning wheels for a few years, knowing what we wanted to say but trying to figure out the best way to say it, we took on a writing partner. Working together we refined our material into a cohesive manuscript. Redbrush: How would you describe that “third party”? Randy: You might have to ask her. One great thing about working with Redbrush is that you get to work with writing experts. They can take your existing content, your outline … even your Post-It Notes®, and help you build a superior manuscript that reads as well as what would come from a traditional publisher. Redbrush: How was that process? Randy: Easy. It fit my schedule, was manageable, it really elevated the quality of what we wanted to say to our audiences, and I couldn’t be more pleased with the results. Redbrush: Have you launched your book? Randy: We did. At the spring Association of Fundraising Professionals convention in Boston where Jay was speaking. Redbrush: What did it feel like holding that first copy in your hand? Randy: Though I’m not a father, I imagine it’s a lot like the birth of a child .. just as moving, as impacting as anything I’ve done in a long time … and I’ve done a lot! Redbrush: What services from Redbrush did you use? Randy: In addition to the title editor, we used Redbrush’s editorial services. Redbrush did all of the design work for the printed books and for the eBooks. They prepared and printed some Advance Review Copies (ARCs) to help get endorsements and blurbs for the book. They helped with listing the book and eBooks with online and other retailers. Redbrush: Did they print any copies of the book for you to sell? Randy: Yes. We knew we needed copies to accompany our speaking engagements. But we also plan to give copies to prospective clients, too. Our book is a terrific leave-behind to show our prospective partners that we’re experts in our field. I pass them out like business cards. Redbrush: What would you say was the most important part of the process working with Redbrush. Randy: There are two things, really. First, we worked one-on-one with a Redbrush navigator who helped chart our course through the whole process. We explained what we wanted to do … where we wanted to land and he put together exactly the package of services and steps to follow. Our expertise is all about nonprofits and helping them market themselves well. Redbrush knows publishing. Redbrush: What was the second most important thing? Randy: Redbrush showed us how to be our own publishers. We’ve created our own publishing entity called Nonprofit Hub Press. Redbrush showed us how to retain control of our content, how to be our own publishers, and how to retain the profits from sales of our book. We’re able to put all of our proceeds back into nonprofit education and services. Doing it this way, Redbrush’s services were deductible. This wasn’t a hobby for us, but another way of building on our personal brands as speakers, as well as our professional business. Redbrush: That could sure be helpful during tax time. Redbrush: To whom would you recommend Redbrush? Randy: We’d recommend Redbrush to anyone who is serious about their book. If they’ve got a project that needs and deserves expert service, Redbrush is the way to go. Be ready to get serious and work with a great team of professionals. Redbrush: What was one surprising thing about working with Redbrush? Randy: Not feeling sold or being pushed. I fully expected a hard-press sales process, but that’s not how Redbrush works. Once my co-author and I defined our project, goals, and audiences, they laid out a plan to complete our book and meets our stated goals with a book ideal for our target audiences. It’s a fully customized process for your specific title. If you’re serious about your goals and hopes for your book, you choose the right team and the right services to realize them. Redbrush: Can you tell us the URL for your book? Randy: Sure, we have a website for the book that’s CaptivateAndEngage.com. Randy: Write. Publish. Be Red. Redbrush: If you know what you want to accomplish and what you want to say, but need help to realize your dream and destination, check out Redbrush. Learn to be your own publisher with the greatest confidence.